The Ladies of Letterpress annual conference never fails to deliver an amazing week of printing, creating, and inky, hands-on, up to your elbows fun. Add to that two letterpress movies, and the time in St. Louis, Missouri was pretty much letterpress supreme delight. Cathy Smith I often find it hard to describe to other printers what the conference experience is like and to give it justice. You are in a bubble for five days where conversations center around printing and antique presses and it’s never boring. The energy is great and I usually end up saying, “you have to go there next year”. 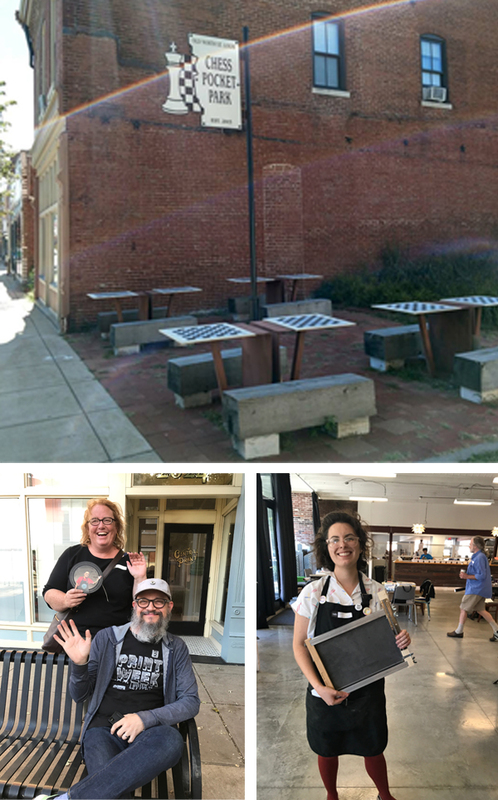 This year’s conference was in Saint Louis and was a collaboration with StL Print Week which is offered through Firecracker Press and Central Print. St. Louis itself has a lot going on in terms of attractions, housing renovations, and pockets of strong community sustainability projects. 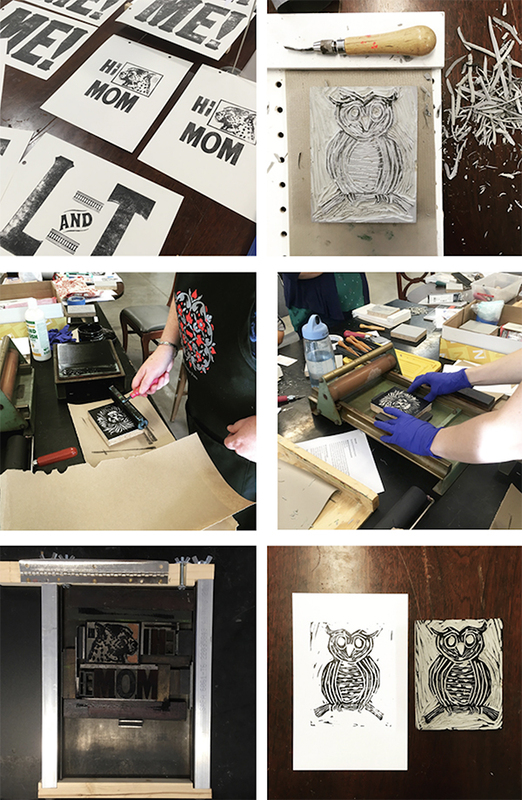 Our activities centered around Firecracker Press and Central Print which share a wonderful joint storefront space. The neighborhood has little “pocket parks” on many of the blocks, and is on the cusp of bursting into a vital place to live and work. That just added to the appeal of our conference headquarters. 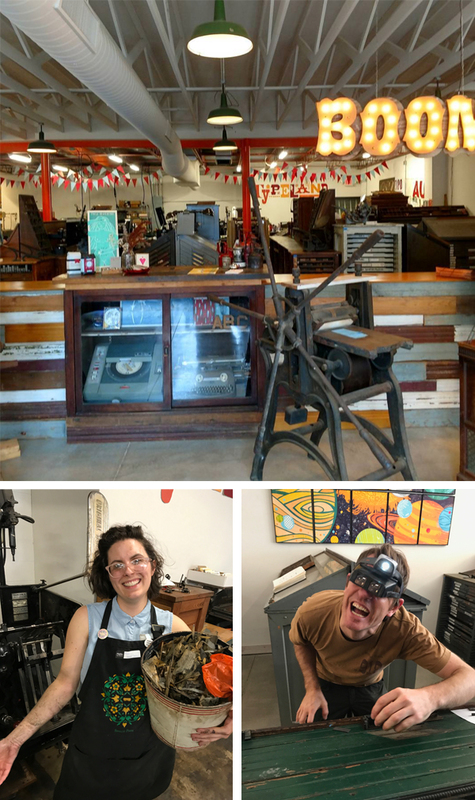 It was easy to get excited about our printing space because of the many vintage presses, the aisles of type cabinets, the retro and bohemian décor, and so much natural light. With the help of Peter Fraterdeus, I gained a larger appreciation for wood type as we learned to look at the letters as art forms of negative and positive spaces, I tried my hand at linoleum block carving taught by Rachel Kroh and have a new passion for this. I love the endless possibilities of photopolymer plates; however, it was freeing to work with other tools to create printed projects. What I really love is meeting fellow printers as we talk about all things letterpress. I revel in the information sharing and passion of panel discussions, and can highly recommend Pressing On: the Letterpress Film. If you have an opportunity to see it, do so, and then watch it again. 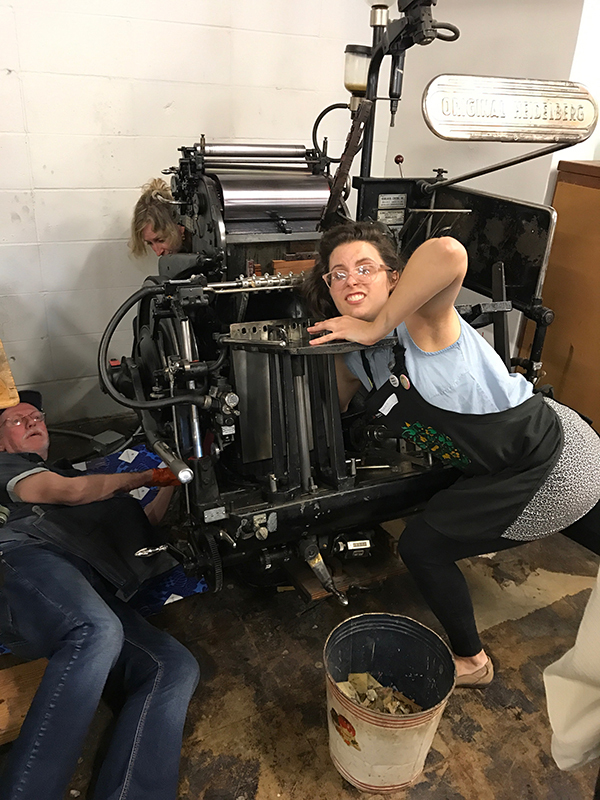 This year, I was joined by three of our printers from Boxcar Press, plus owner Harold Kyle, and it was great to share with them the experience and value of a Ladies of Letterpress conference. Samantha Peck Samantha is one of our windmill printers here at Boxcar Press and she agreed that being able to attend the event this year was an unforgettable time. 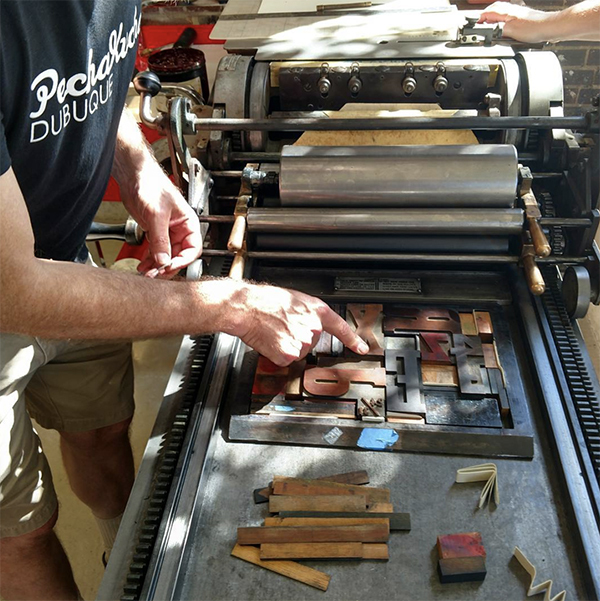 The opportunity to learn letterpress printing from the most advanced printers in the industry left me with a wealth of new knowledge, tips, and tricks to incorporate into my daily printing at Boxcar. Thanks to the great workshops offered, I now own my very first press that I built from household materials! I also was able to use a variety of different presses and type to create unique prints that I turned into the covers of my handmade journals. I even got to try out linoleum block carving. Through hands on learning and expert printers’ shared stories and advice, I gained some absolutely invaluable experience and memories. It was very rewarding to see so many inspired and creative printers all in one place carrying on the art of letterpress printing together. Madeline Bartley Another one of our windmill printers recalls that her best moment from Ladies of Letterpress was during her workshop, Advanced Windmill with Graham Judd. 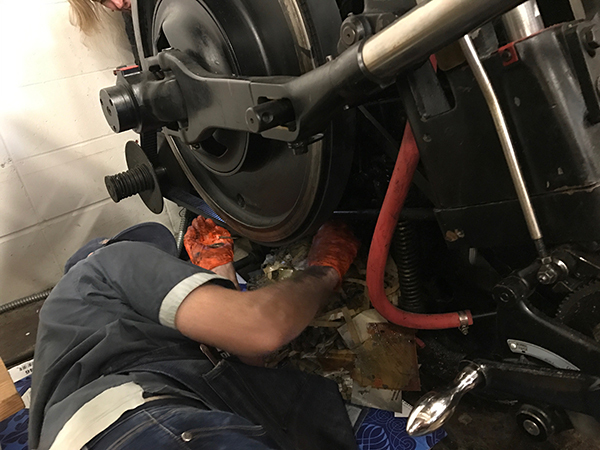 During a demo we became curious about the condition of the windmill’s impression lever. Why doesn’t the lever release back to its usual position? The red ball lever didn’t move back far enough. The lead to Graham and I pulling out old die cut scraps from the base. Together we pulled out two waste baskets of oily paper detritus. 40 years worth! It was like an archeological dig into letterpress history. This Boxcar Lady had a wonderful time attending the conference and is looking forward to more in the future! Leanna Barlow My experience at Ladies of Letterpress/ Print Week was absolutely amazing. Spending time in another city surrounded by people who love the same thing you do is surreal. I have only worked at Boxcar press for about 2 years. At Boxcar we don’t set type, so this was my first time seeing such a vast collection of type! And actually getting to use it. Firecracker Press has such a great space and the staff was so talented and passionate about printing. I think what I took away from the experience overall was the willingness to teach and be taught, particularly by some who have been printing substantially longer than me. It was nice to see that there was no “generation gap,” as they call it. The older generation of printers was genuinely excited to be with the new and up-and-coming printers like myself. For me, making my own press out of everyday supplies, along with the advanced windmill class, has helped me develop as a working printer and an artist. A huge shout-out to all the amazing participants at the Ladies of Letterpress conference this year! Have a fun story or cool thing you learned at this year’s meet-up? Let us know in the comments below! This entry was posted in Letterpress Is Fun and tagged Ladies of Letterpress, Ladies of Letterpress Conference, Missouri, St. Louis letterpress by Cathy. Bookmark the permalink. I loved being there too, amongst all you talented and enthusiastic letterpress ladies! Go girls!